I woke up at 2.37AM this morning with no idea what had woken me up. But the second I looked at the clock, Target opened an eye and decided it was the perfect time to snizzle. He was lying curled up against me so it was the work of a moment to snuggle up to my chin and give me fuzzy headbutts. He purred so loudly that Tom woke up too. Target promptly climbed over me so he could talk to both of us at the same time. He was in heaven, we were trying to pet him AND stay asleep. Drifting off again, we were woken up again at about 6AM by Au. As he ran out of roast chicken yesterday afternoon, our senior fuzz was not in a good mood. He said hello rather grumpily and made Tom get up to give him some cat food. This is him looking grumpy on the left. But Au's mood improved when I got up and went out. He knows a wet market run when he sees it. Now there is a piece of chicken roasting in the oven and Au is sitting in front of it, making sure he's on the scene the second it's ready. Hopefully it will put him in a better mood! For more Cats on Tuesday, visit Gattina. 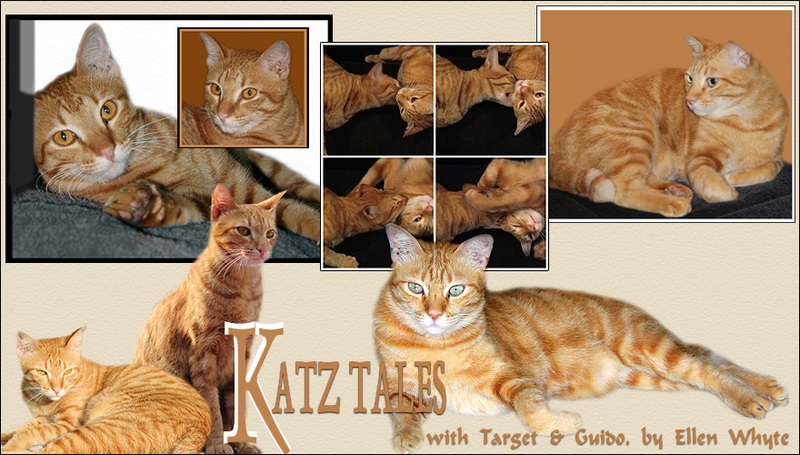 By the way, Cathy says that as Katz Tales is only out once a month now, and Dog Talk is out once a month only too, I should blog more often. I'll write posts on the next few Fridays. If there's enough traffic/interest, I'll continue. Also, Katz Tales is out in the print version of The Star, the Malaysian national daily, Weekend section this Saturday. Buy it please and don't forget to write in for the picture contest! Details of how to enter are posted here. I hope Au is in a better mood now that he's got his roast chicken! He did look pretty grumpy when he didn't have it! Yes, please. Every Tuesday and Friday would be great! Oh my. That is a grumpy looking feline if we ever saw one. So the cats won't let you sleep peaceully until they get what they want! That's quite a demanding friends you have...haha! Love the grumpy look! thanks for taking the time to entertain us with target's and au's antics here. since i am not ready to take care of cats yet , i make for the lack of cat by reading about your cats. What a face! Very cute, although I'm sure he didn't mean to be cute :)! We'd love to read more about Au and Target too. My kitty wakes me up all the time and it is usually at 5:30 in the morning. Hugs to your kitties. Oh, Au looks so cute when he's a grumpy-wumpy! Chloe and Pixie both look just like that when they have just woken up! Lucky Au to get roast chicken. Mine get Addiction wet food when I want to make them happy. Turkey or King Salmon usually does it for them! That pouty grump is too cute. My dh has banned the kitties from our room because of all the middle-of-the-night antics...worse than having a baby again lol. Thanks for stopping by! Roast Chicken would put me in a better mood! YEAH! Our computer liked visiting you today--we haven't been commenting as much as for some reason our computer didn't like site for awhile... sometimes it does that.